The latest rounds of budget cuts at New Mexico State University proved to be an obstacle the Aggiesâ€™ equestrian team simply could not clear.The womenâ€™s varsity sport that has produced 10 All-Americans in its 11 years of existence and had 26 student- athletes on its roster last year â€“ sharing the equivalence of 15 full scholarships â€“ has been eliminated.â€œItâ€™s the last option you ever want to look at,â€ NMSU athletic director Mario Moccia said. â€œWe talk religiously here, even with all the budget issues weâ€™ve had since I walked in the door, that our main goal has been to have the student-athletes feel the least impact of the budget cuts.â€All scholarships for existing athletes will be honored through their four-year commitments at NMSU, and the move does not place the department in jeopardy of facing any Title IX gender equity compliance issues.A few months after announcing $425,000 in budget cuts, athletics was tasked on Wednesday with making $600,000 additional cuts. The news was released as NMSU president Garrey Carruthers announced more details of the universityâ€™s financial woes that will require 126 job cuts university-wide. That will include the elimination of 89 open positions and 37 filled positions. 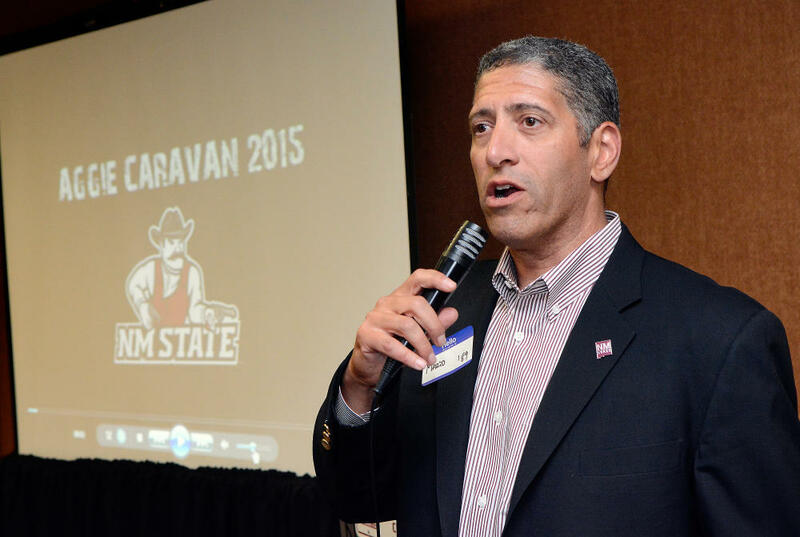 NMSU athletics operated last fiscal year under a $17 million budget.â€œYouâ€™re talking about a seven-figure reduction in a short period of time from a department that isnâ€™t fat at all,â€ Moccia said. â€œSo, I wish there was another solution, but when you start talking big-ticket budget reductions, you canâ€™t just pick off little things here and there anymore.â€The elimination of equestrian will account for the majority, though not all, of the $600,000 in athletics cuts. The university will also eliminate one existing job in athletics administration. Moccia said there was also salary savings from the April coaching change in menâ€™s basketball when nine-year coach Marvin Menzies left to coach UNLV and assistant Paul Weir was hired to replace him. There was also salary savings in some of the other shuffling of positions on the menâ€™s basketball staff.As for equestrian, though, the sport accounts for $417,000 per year, Moccia said. Head coach Robin Morris-Walters in the second of a two year contract and will be paid the remainder of her 2016-17 salary of $44,000. NMSU confirmed the head coach position will account for $60,300 off the books with benefits added. The teamâ€™s assistant position has been vacant for some time.The NCAA is classifying equestrian not as a championship but an â€œemergingâ€ sport. With Wednesdayâ€™s news, there are now only 16 Division I programs in the country.Athletics department staff called each member of the team Wednesday morning before the announcement was made public.Moccia said there was a lot of emotion in the calls, but not much conversation. â€œDisappointment. Surprise. Those are the two words Iâ€™d use,â€ he said, describing the reaction of the athletes.Each member of the team will be sent a formal letter with details of the decision, and each still will be allowed full access to all athletic department academic resources and other resources.NMSU has six menâ€™s sports, the NCAA minimum, and now 10 womenâ€™s sports. Last year, female student-athletes accounted for 55.5 percent of NMSUâ€™s varsity sport scholarships. The female enrollment of NMSUâ€™s general student population was 52.8 percent.Title IX requires athletic departments to provide financial aid and participation opportunities to women at a rate proportionate to the universityâ€™s female undergraduate enrollment.